Before I start this one, I should make clear that I like Sebastian Vettel and consider him to have great potential in F1. It is not his fault that he was picked as the replacement for Scott Speed in the Toro Rosso team but it is inevitable that I should make comparisons as a result. With Scott now playing with his countrymen in stock cars, the manner of his departure from F1 is something of a dead issue but I still feel the need to speak up for him when others make ill-informed judgements of his performance in the sport. Obviously, the way to assess Vettel is to compare him to his team mate, Antonio Liuzzi, and, until Fuji, it was clear that Liuzzi had the upper hand. No surprise in that, really - Vettel is young and inexperienced in F1 racing so we should give him time to find his feet, just as we did with Kovalainen. I would add that Liuzzi is much better than anyone remembers and so the rookie's task is even harder. But we also need to be realistic about Vettel's performance in the Japanese GP. He did extremely well to get through to Q3 but comparisons with Liuzzi are not possible since the Italian was on dry settings in qualifying (an odd decision but justifiable as a gamble for a team running at the back of the grid). 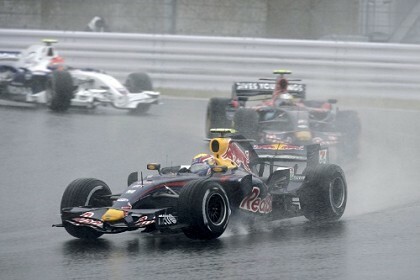 And Vettel showed real ability in the race, running with the leaders until his unfortunate incident with Mark Webber. Let us not get too excited, however; the likelihood is that Scott would have done at least as well in the same conditions. He showed at Monaco that, when the car was capable of it, he could lift it above its expected position and he is also known to be pretty good in the wet. As far as I am concerned, the jury is still out on young Vettel and it remains to be seen whether he is any improvement on the American. We also need to give Liuzzi his due in driving a solid race that would have resulted in a point for the team without Spyker's protest. So it could be said that Tonio still performed better than his team mate in the long run - he finished the race, Vettel didn't. Vettel's penalty of ten grid positions in the Chinese GP seems unduly harsh to me. His removal of Mark Webber and himself from the race was a rookie's mistake and should be treated with a little more leniency. It is understandable that Webber should be annoyed at having the chance of a win so unceremoniously removed from his grasp, but any future grid penalty imposed on Vettel does not give the Australian any compensation. I suppose the theory is that such a stern penalty will encourage Vettel not to repeat the mistake but, judging from the rookie's despair after limping back to the pits, he is hardly in need of such a reminder. Moving on from the Toro Rosso team, I must say that I find the FIA's reaction to the Ferrari email upset rather strange. Instead of behaving with their usual disregard for the opinions of the teams and rigidly applying the rules, they have apologized profusely and vowed to back up their communication systems in future. It could be said that Ferrari caused their own problems by not checking their email more frequently and deciding to go for a very dubious tire strategy in the first place, but instead we have the unheard of situation where the FIA are taking the blame. The inescapable conclusion is that the FIA is in Ferrari's pocket, just as so many have said before. I do not need to say such things as, "Would the same apology have been forthcoming had the team been McLaren? "; it is only necessary to remember the FIA's intransigence over a far more important matter when all of the teams except Ferrari needed a little flexibility in the rules at Indianapolis in 2005. If the FIA want to be seen as impartial, they should stop providing so much evidence that the reverse is true. Instead of apologizing, they should have penalized Ferrari for contravening the rules, regardless of whether or not the team received the email in time. That would be consistency. In spite of all the controversies (or perhaps because of them), the Fuji GP was highly entertaining. There was hardly a dull moment throughout the race and one can hardly blame the TV director for missing a few incidents. A few more races like that and the criticisms of F1 as boring would die away. To be honest I couldn't believe it when it happened, but I think that handing him a 10-place penalty is incredibly harsh - surely noone can justify that. Now he has calmed down and stopped swearing, maybe even Mark Webber thinks it a bit harsh too. I hate comparing drivers, as it's impossible to compare like with like as there are just so many variables. To say Lewis Hamilton is the best rookie ever is not really fair on other drivers - he has had a car advantage (how good would Schumacher or Alonso have been in their first year if they had been in this year's McLaren?) so I don't think it fair to compare Speed with Vettel either. At the end of the day, the record books are what remain, so as Hamilton is going to win the championship in his first year then he will be regarded as the best, in the same way as the record books will judge Scott Speed - no matter what those who actually saw him race thought of him as a driver. All in all, Japan was an enjoyable race - except for the safety car start which deprived usof the best part of any race! You're absolutely right, Craig, and the only reason I continue to mention Speed is because others do. It's unfair to compare Vettel's record with Speed's, just as it is unfair to say things like Scott was out of his depth in F1 (as I've seen on other websites). But, as you say, it's my duty to continue to point out the facts when others disparage Speed. It was a personality clash that did for his chances in F1 and nothing to do with performance. I wish Scott Speed had not gone to stock cars; it does not suit him. He should consider moving to sportscar/endurance racing as soon as possible. I agree that Vettel's penalty is symbolic. Yes, Vettel earned his trip to Q1 at Fuji, but don't kid yourself; the odds of the feat being repeated in the last races are slim. Next year, things will be different. I think the only reason Scott is going to NASCAR is that Red Bull wants him there, Chunter. You're right, it doesn't suit him and he would be better off in sportscar or endurance races if he can't get a drive in an open wheel series. Even so, it will be interesting to see how he gets on in NASCAR. As for Vettel, I hope the kid does well but he has a lot going against him in the STR team. I would have liked to see Scott take Sab's seat in Champ Car, I know its not a popular series any more but it might have given it a little more exposure. Plus that would give us a way to somewhat gauge his ability to the Fab Sab pairing. Listening to talk here in the US I was fairly certain that Speed would end up in an Indy car. So my surprise was genuine. It saddend me also, here is a very talented open wheel racer who had a conflict of personalities. It is fairly safe to say that the equipment he had in F1 was not up to par. Going to NASCAR was not the correct decision for him. Money had everything to do with this. The pits are not so friendly in NASCAR between teams and he will have a rough time as Montoya is. Not to many drivers like the skills of Montoya. NASCAR is a completely different form of racing. Touching and grinding are part of the game. I think that is the reason that I do not particularly enjoy the sport. Something unsuffisticated about it. Scott Speed is a F1 jockey he needed to stay even if he would be a test driver for another team. Tough break for us F1 fans especially the American ones. Agreed, John, Speed has always just wanted to be in F1. But he's committed to Red Bull and NASCAR was where they wanted him. John's comment above, "(in NASCAR) .... touching and grinding are part of the game." I'll have to invite him to some local kart tracks here, 'team play' means three cars follow nose to tail forming a wall and the forth car slingshots past on the inside SLIDING along the wall. Some call it "trading paint". My car is lily WHITE and shall remain that way! Scott Speed.......well WE would have been happier to see hm in an open wheel car but maybe $$$ had something to do with his particular move. Montoya hasn't done that badly in the big cars he's currently about 19th in a field of 50+ plus NASCAR drivers. Again the car plays a part also.